Unlike online infographics drawing program that always requires monthly or yearly paying for their services, desktop infographics program offers lifelong service with one-off payment. 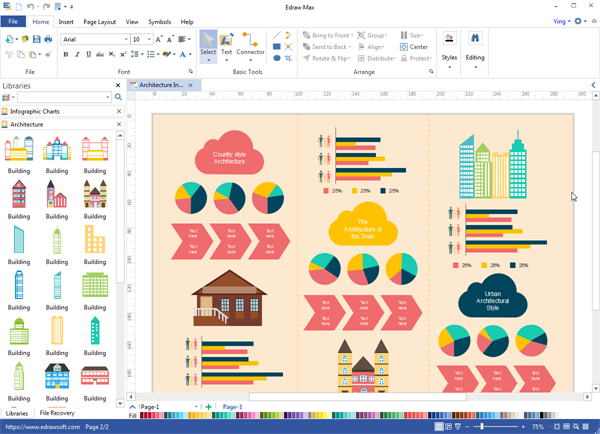 Infographics desktop drawing software can work regardless of internet connection, and it's available for both Windows and Mac. Edraw Infographics desktop software is a versatile toolkit used to communicate information effectively through visual content that is accompanied by minimal text. You can use it to make successful infographics which are both visually appealing and simple enough for anyone to understand. The interface is quite user-friendly as it is similar with Word. Get started as quick as lightning with premade symbols and ready-to-use templates. The flexible import and copy/paste capabilities allow you to input data from many different file formats. Save your diagrams as local files. Edraw also offers a variety of exports, making it easy to share files in the needed format. A state-of-the-art desktop application. Supports Windows and Mac OS X. Allows to create interactive presentations, infographic and other kind of engaging content. Access 8500+ shapes of high quality with scalability in vector format, which are easily editable. Gain various elaborate templates and examples right within the program. Automatic smart chart and graphs templates. After you enter data into a smart chart, it changes automatically. Saving you hours of frustration trying to do it manually. Easy to draw any shape you want with the Pen and Pencil drawing tools. All your diagrams and content shared with your colleagues online and backed up as local files in your computer. Learn form others. Get inspired by looking at the best practices. Think beyond traditional. Come up with innovative ideas. Ensure your data is reliable. Collect statistics from authorized resources. Tell an interesting and visual story. Stories are relatively more attractive and persuasive. Design with simplicity in mind. Less is more. Make it readable at a glance. Use short text. People won't be interested in long passage in infographics. Make it artistic and aesthetically beautiful. Have professional designer to help you review your own design.